Oxalis or yellow woodsorrel (Oxalis stricta) is a common cool-season perennial weed that persists almost year-around in Southeastern lawns. It grows sporadically in landscape beds among shrubs and flowers, in vegetable gardens, and is known to pop up occasionally in container plantings. Oxalis (O. stricta) can be pulled up by hand easily when found growing intermittently in landscape beds. Oxalis has an upright form with slightly hairy stems that branch from the base of the plant at almost ground level. Erect stems give rise to an alternate leaf arrangement. Oxalis stricta leaves are green, whereas the commonly found creeping woodsorrel (O. corniculata) has green to purple leaves. Oxalis leaves are distinctly trifoliate (leaflets of three) with a heart shape similar to the leaves of clover. Often the leaves will fold along the midrib and hang down in the heat of summer, in intense light, and at night. Oxalis produces 5-petalled, yellow flowers singly or in clusters on a branched stalk. Small okra shaped fruiting capsules are formed that contain minute seeds. When mature, seeds are ejected from the capsule for a considerable distance from the parent plant. Oxalis reproduces primarily by seed but may spread by underground slender rhizomes. Oxalis (O. corniculata) often invades container flowerpots but can be easily removed by hand pulling. Oxalis produces a 5-petalled, yellow flower followed by a seed capsule. Oxalis grows under a variety of conditions, but prefers moist fertile soils and full sun. It will tolerate shady areas. All plant parts are poisonous because of the production of soluble oxalate, but are only mildly toxic and generally causes little problem if ingested. Oxalis flowers and produces seeds heavily in the spring and summer, but can produce both all year long. Small plants can easily be handpicked or dug as they appear before they flower or form seed. Removal of all vegetative portions of the plant, including roots and rhizomes, is important. Rhizomes can be easily removed when soil is moist. Do not place the weeds with seeds in compost bins for reuse in the landscape. A light layer of mulch in landscape beds and around flowers and shrubs will aid in preventing further germination of oxalis seeds. The seeds require light for germination, so limiting light to the seedbed with mulch will reduce the numbers of new oxalis plants. Oxalis forms a fruiting capsule that contains multiple seeds. Maintenance of healthy, dense lawns will create less space for oxalis to invade. Lawn maintenance should adhere to fertilizer and lime recommendations obtained from soil test results combined with proper mowing height and frequency requirements. For more information on soil testing, see HGIC 1652, Soil Testing. In landscape beds, a non-selective herbicide containing glyphosate is the best choice for spot treatment of oxalis. Apply glyphosate spray to thoroughly wet the foliage of the weeds. Target oxalis seedlings and young plants (before the flowering stage) for best results. Examples of products containing glyphosate are listed in Table 1. Always read product labels for safe use around landscape ornamentals and established perennials. Table 1. Examples of Products Containing Glyphosate in Homeowner Sizes. For small numbers of oxalis plants scattered throughout the lawn, a spot treatment with a recommended post-emergent herbicide may provide adequate control. For larger oxalis infestations in the lawn, pre-emergent and post-emergent herbicides may be necessary. Pre-emergent herbicides prevent seed growth, whereas post-emergent herbicides are applied to foliage of the weeds once they emerge. Post-emergent herbicides are often more effective at killing smaller weeds rather than older, mature ones. Pre-emergent and post-emergent herbicides for oxalis (yellow woodsorrel) control in South Carolina lawns are listed in Tables 2 and 3. Always read the product label for mixing rate for weed control on each turfgrass species and for safe use of the product. Pre-emergent herbicides need to be applied at the proper time of the year, may require one or more subsequent applications, and need to be watered in appropriately. When using a post-emergent herbicide, spray to just wet the foliage of the weeds. For safe use on lawns, spray herbicides when temperatures are below 90 °F. Avoid pesticide drift by spraying on non-windy days. Irrigate the lawn the day before application to reduce drought stress to lawns and to promote active growth of the weed for better herbicide uptake. Table 2. 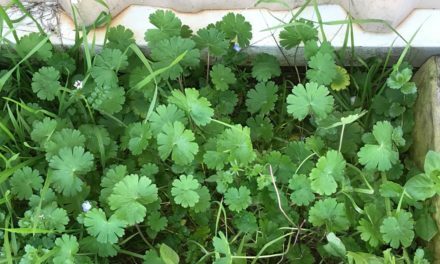 Pre-emergent Herbicides for Oxalis Control in Home Lawns. oryzalin Southern Ag Surflan A.S.
Notes: These pre-emergent herbicides should only be applied to well-established turfgrass lawns. Typically, the optimum time for lawn fertilizer applications and pre-emergent herbicide applications do not coincide. However, the small amount of potash in the 0-0-7 blends is not a problem, & may be useful on sandy soils with fall applications to improve cold weather hardiness of the lawn. Table 3. Post-emergent Herbicides for Oxalis Control in Home Lawns. 1For use on common bermudagrass. Intermediate safety on hybrid bermudagrass. 2Use low rate on zoysiagrass.